As Posted by the Peterborough Examiner, May 1, 2012. Custody battles can get ugly — parents at each other’s throats, accusations flying, outright lies to alienate children from their father or mother and sometimes loud, abusive confrontations in front of the kids. But the good news is that when the Office of the Children’s Lawyer gets involved in these disputes, the rate of settlement is “very, very high,” said Lucy McSweeney, children’s lawyer for Ontario (Pictured above). 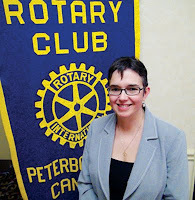 McSweeney, appointed to the top position in the office in September 2010, addressed the Rotary Club of Peterborough on Monday afternoon at the Holiday Inn. She explained that her office provides lawyers for children. The children are their clients. “We help the courts help the children,” she said. The lawyers are increasingly involved in custody and access disputes, she says, but also help out children with financial issues and personal injury claims. The Office of the Children’s Lawyer is part of Ontario’s Ministry of the Attorney General and provides legal services to those under 18. McSweeney, who works in Toronto but has a cottage in Douro-Dummer Township, told Rotarians that her office is publicly funded but does not represent the government. “And that’s important because sometimes, to help the child, you have to take on the government,” McSweeney said. Helping children with financial issues could include disputing wills. She gave an example of a girl who couldn’t live with her mother anymore because of her mother’s mental-health issues. The grandmother took the girl in but never changed her will to ensure the child would be taken care of after her death. “We helped the courts to adjust the will,” McSweeney said. She said it doesn’t matter if the child gets $2,000 or $200,000 from the will because every bit helps. During custody and access disputes, often the children will tell the lawyers that all they want is for their parents to stop fighting. McSweeney said the lawyers and social workers who work in the office often talk with the people in the child’s life such as the parents, sporting coaches, teachers and doctors to paint a picture for the court of what the child needs. “We’re not interested in helping mom or dad succeed in their vendetta,” she said. McSweeney added it’s the office’s goal to give children the best chance in life. “We’re proud of what we do,” she said. It’s difficult for the office to measure success, she said. “But we do know we make a difference,” she said. During a question-and-answer period, an audience member asked how the office gets referred to a certain case. McSweeney responded that a children’s aid society can ask a court to request the office’s help. Or a judge could decide alone that a children’s lawyer is needed. “It’s to have an independent voice for the child,” she said. NOTES: Lucy McSweeney, Children’s Lawyer for Ontario, has another local connection. She said her daughter has attended Camp Kawartha….. The Rotary Club of Peterborough will make a donation, in McSweeney’s name, to Sleeping Children Around the World in appreciation of her talk to the club.